Prices are set at the time of purchase. 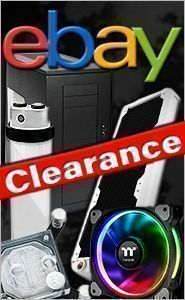 Performance PC's, Inc. offers no form of price protection. All prices listed are in US currency. Performance PC's, Inc. normally updates prices every Monday - but prices are subject to change without any type of notice. Residents of the state of Florida will be charged 6 - 7.5% sales tax depending on your county. We are not responsible for typographical errors that might occur on the website or any electronic communications (ie. emails, newsletters, etc.) . Prices that are too good to be true probably are mistakes, and will NOT be honored.We will though quickly fix any mistake on the website with prices or other information if it is brought to our attention. Performance PC's, Inc. reserves the right to refuse or cancel an order at any time, for any reason. In addition, an automated electronic order confirmation does not indicate acceptance of an order. Performance PC's, Inc. offers our customers a 30-day warranty on all purchases. Failures or problems past 30 days will move to whatever the manufacturer offers for their product warranty. Special Information Regarding Power Supply Warranties. Please note that our custom sleeved power supplies are opened by us in order to be able to sleeve the cables into the casing. Since we have then already opened the power supply, that may in fact void the manufacturer's warranty. In order to be fair and protect both our customers, and our interest, we now offer a Performance PC's Extended Warranty on all power supplies. What this warranty does is cover not only the power supply itself but, also a complete new Mod, including the recovering of the wiring with sleeving and changing over any fans, molex connectors, and case covers. If you choose to purchase this option from us you will receive a paper describing this warranty, the start and end date of this warranty, and your Order number, which will serve as the Warranty Number. If you choose to decline this option when ordering then, your modded power supply, is covered for only 30 days by us which includes a new unit and redoing all Mods. The cost for the warranty will be a very nominal $9.99 to $29.99 depend on model and price of unit. This warranty IS transferable to any new owner of the power supply should you decide to sell it as long as they receive and keep the Warranty Paperwork. ** Please note that all returns are subject to the Product Return Procedures that are stated in the Shipping and Returns section on our website. ALL PRODUCTS SOLD ON THIS WEBSITE ARE TO BE USED AT YOUR OWN RISK! Under no circumstances is Performance PC's, Inc. liable for the following: (1) third party claims against you for damages, (2) loss of, or damage to your records, data, or any type of hardware/equipment, (3) economic consequential damages (including lost profits, lost data, or lost savings), or incidental damages even if we are aware of the possibility. Again, use all of the products we sell at your own risk! Performance-PCs.com will not be responsible for any manufacturer changes to products specifications or appearance listed on this website other than to update web pages as soon as these changes are brought to our attention. Any product that has changed since initial listing on the website can be returned for a full refund less shipping (no restock fee). Any dispute arising out of or related to these Terms and Conditions or the sales transaction between Performance PC's, Inc. and Customer shall be governed by the laws of the State of Florida, without regard to its conflicts of law rules. Specifically, the validity, interpretation, and performance of this agreement shall not be governed by the United Nations Convention on the International Sale of Goods. Performance PC's, Inc. and Customer consent to the exclusive jurisdiction and the venue of the State Courts of the State of Florida to resolve any dispute between them related hereto, and the parities waive all rights to contest this exclusive jurisdiction and venue of such Courts. Finally, the Customer also agrees not to bring any legal action, based upon any legal theory including contract, tort, and equity or otherwise, against Performance PC's, Inc. that is more than one year after the date of the applicable invoice. If any provision contained in this agreement is or becomes invalid, illegal, or unenforceable in whole or in part, such invalidity, illegality, or unenforceability shall not affect the remaining provisions and portions of this agreement, and the invalid, illegal, or unenforceable provision shall be deemed modified so as to have the most similar result that is valid and enforceable under applicable Florida law. These terms and conditions, together with the Performance PC's, Inc. invoice respecting the products ordered by Customer, are the complete and exclusive agreement between Performance PC's, Inc. and Customer, and they supersede all prior or contemporaneous proposals, oral or written, understandings, representations, conditions, warranties, and all other communications between Performance PC's, Inc. and Customer relating to the subject products. This agreement may not be explained or supplemented by any prior course of dealings or trade by custom or usage.